Tax cuts and a slowing economy will erode America’s fiscal strength during the next decade, according to a new report from Moody’s Investor Service, the bond-rating agency. At some point, Moody’s might cut the nation’s top-tier credit rating. The Moody’s warning challenges a core promise of President Trump and his fellow Republicans, who insisted the $1.5 trillion tax cut they passed last year would pay for itself and even generate more tax revenue, not less, because economic growth would suddenly boom. Trump predicted last year that the economy would “take off like a rocket ship” once his tax cuts went into effect. 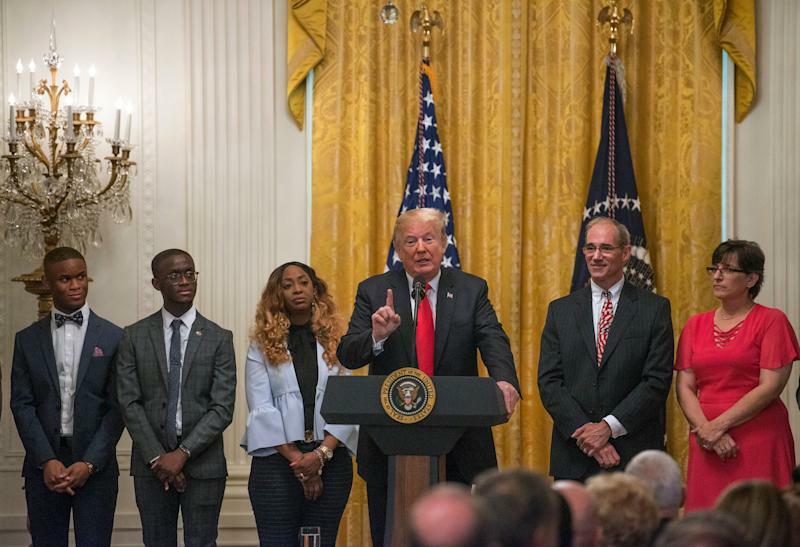 White House economists predicted family incomes would rise by $4,000 or more due to a sharp cut in business taxes. None of that is happening or coming into view. The economy grew at a robust 4.2% in the second quarter, the highest level since 2014. But Moody’s Analytics predicts growth of just 2.9% for all of 2018, and 2019 as well. It will then fall to 0.9%, according to the forecasting firm. If so, economic growth under Trump would average just 2.2% per year, almost exactly the same as during President Obama’s second term. The federal budget deficit, meanwhile, rose from 3.5% of GDP in 2017 to 3.8% in 2018. 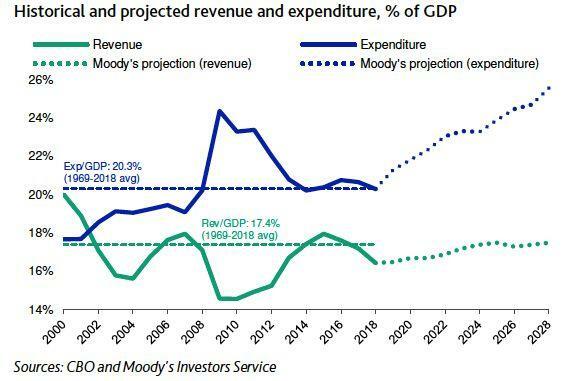 Moody’s expects it to hit 4.8% of GDP in the current fiscal and soar to 8% by 2028. The U.S. fiscal debt burden is the heaviest among nations that earn Moody’s Aaa rating, its highest. 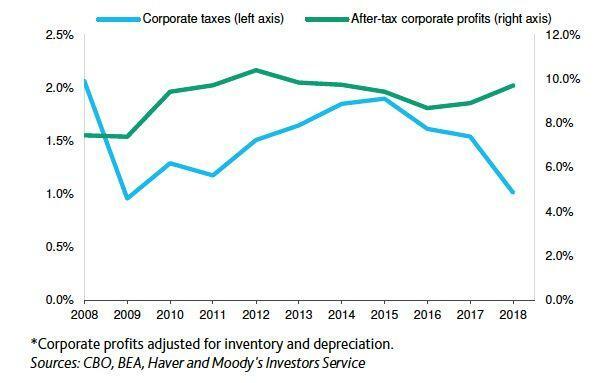 Corporate profits are surging--but tax revenue from businesses is going the other direction. When the economy’s strong, as it is now, the government’s debt burden normally declines rather than spiking. That’s because businesses and individuals earn more money and therefore pay more taxes. But the Trump tax cuts have weakened revenue intake, pushing deficits up. Tax revenue from businesses fell by 31% in fiscal 2018, which ended in September. That decline mostly came from cutting the corporate tax rate from 35% to 20%. Tax revenue from individuals rose by 6.1% in 2018, but that was mostly because of inflation, population growth and 1.7 million new jobs created during 2018. The deficit rose from $666 billion in 2017, before the tax cuts, to $779 billion in 2018, when the tax cuts had been in effect for eight months. The deficit is likely to approach $1 trillion this year, an unprecedented gap for an economy that’s supposedly booming. During the late 1990s and early 2000s, unemployment was roughly as low as it is now, but the government ran a budget surplus for four years in a row. The gap between government spending and revenue is growing historically large. Moody’s sees several risks from mushrooming deficits. Interest payments on the debt are likely to rise from 7% of all federal outlays in 2017, before the tax cuts, to 16% in 2028. That leaves less money for defense, roads, student loans and everything else. It also raises pressure to reform and possibly cut spending on Medicare, Medicaid and Social Security, which are headed for their own solvency problems during the next couple of decades. Back in 2011, Standard & Poor’s cut the U.S. credit rating by one notch. Some analysts thought Uncle Sam would have to pay more to borrow as a result, but that didn’t happen. As a borrower, the United States enjoys unique, privileged status thanks to the dollar’s role as the world’s preferred currency, which keeps demand for U.S. Treasuries strong and interest rates low. But privilege can backfire, if it breeds sloppy habits and excess. Moody’s says it will “revisit” its U.S. credit rating—in other words, downgrade Uncle Sam—if “policymakers do not have the capacity to respond decisively to mitigate the country’s adverse fiscal dynamics.” Right now, they seem to have no such capacity.